Pteranodon is the name given to a group of large flying reptiles that existed in the late Cretaceous period, around 80-86 million years ago in what is now known as North America. Its fossils were first found by Othniel Charles Marsh in 1870 in western Kansas, USA while the first Pteranodon skull was found on in 1876 in Kansas, USA, by Samuel Wendell Williston. Pteranodon is also incorrectly referred to as Pterodactyl in various media. The creatures appeared in The Lost World, Jurassic Park 3 and are rumoured to appear in Jurassic World. The largest species of Pteranodon had a wingspan of up to 33ft, were up to 6ft tall and weighed up to 40kg. They were quadrupedal reptiles, using their wings to move around while on the ground. The creatures in Jurassic Park 3 were portrayed as the right size but something they didn’t have was teeth in their beaks like modern birds. 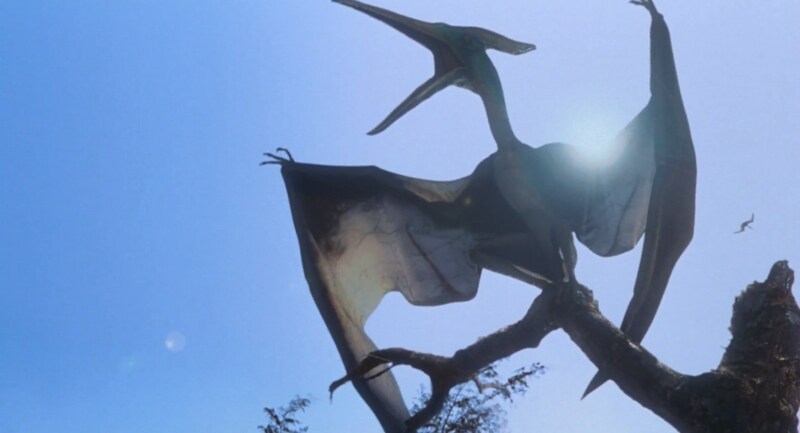 Pteranodon also weren’t capable of grasping onto something with their feet like the creatures in The Lost World or Jurassic Park 3. In reality, they would scoop up fish from the ocean with their beaks. Another distinguishing feature of the reptiles were their unique crest on their heads with males having one larger than the females. It was originally theorized that they were used for counterbalance against its long beak but recently, it’s believed the crests were purely for sexual display. Pteranodons were not included in either of the Jurassic Park novels. Instead, the Cearadactylus featured in the Jurassic Park’s aviary which is similar to Pteranodons but smaller. Director Steven Spielberg thought the aviary sequence in the first Jurassic Park novel would be too expensive and complex to create so it was scrapped for the movie. Originally, there was going to be an action scene in The Lost World as the characters were escaping the Velociraptors. They were going to jump off a cliff with hang gliders but were attacked by Pteranodons or Geosternbergia. Concept art was created as well as models but the scene was abandoned. Another scene cut also involved the creatures attacking the rescue helicopter. 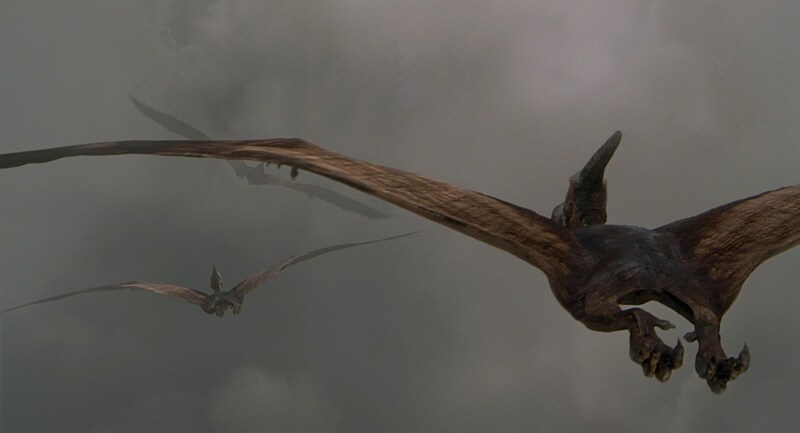 Pteranodons did, however, have a cameo appearance at the very end of The Lost World. They were seen flying over a group of Stegosaurus and one of them is shown resting on a branch. Pteranodons finally have a major action scene in Jurassic Park 3. 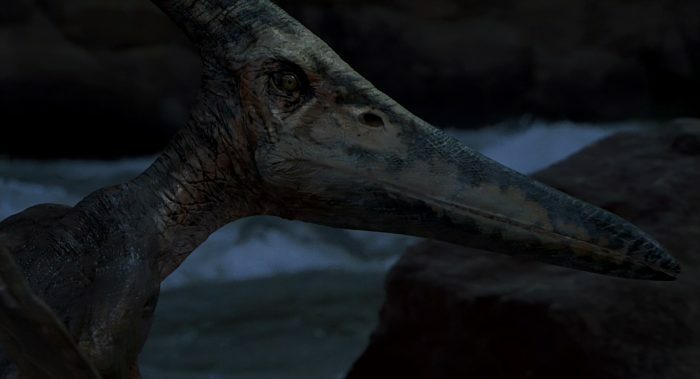 For the movie, the creatures have been re-designed since The Lost World. They are shown to be much bigger and different-coloured, and they also possess teeth which they don’t have. In the film, when Dr. Grant, Billy and the Kirby’s reach the aviary, they are attacked by Pteranodon. One of them flies away with Eric while Billy parasails down to rescue him. 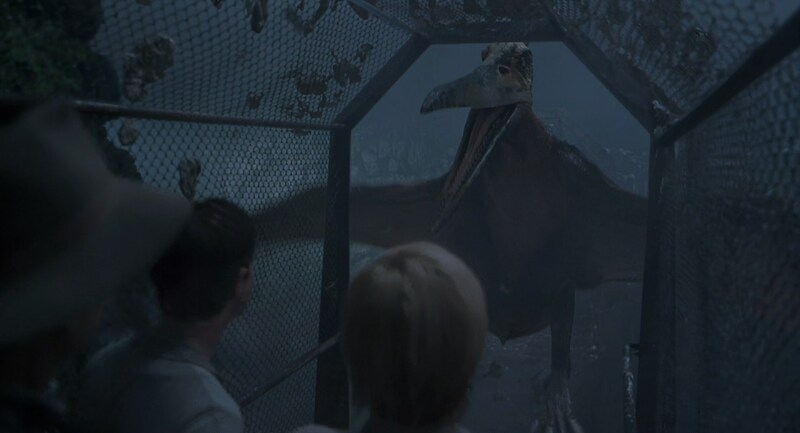 The characters manage to escape the aviary while one of the Pteranodon gets crushed by a falling cage. At the end of the film, we can see that the Pteranodon have escaped the aviary into the world. It’s rumoured that the Pteranodon will feature in Jurassic World. In the park’s brochure, one of the tourist attractions is the Aviary. Pertanodon is bad but Mosasaurus is beter.